The corners have been carved, shaped and completed, and Yonatan has invested this past week in the process of Purfling. If shaping the corners is one of the most challenging steps in terms of coordination and personal artistic touch, then Purfling must be the most challenging step in terms of technical ability. 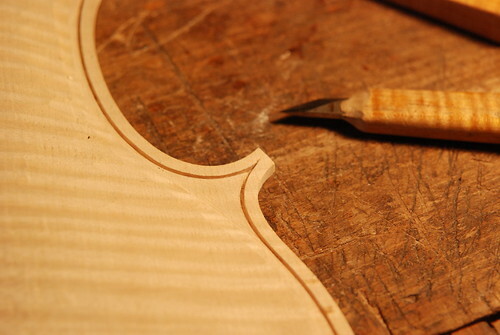 You know how violins, violas, cellos and double basses have a black line going around their contours? 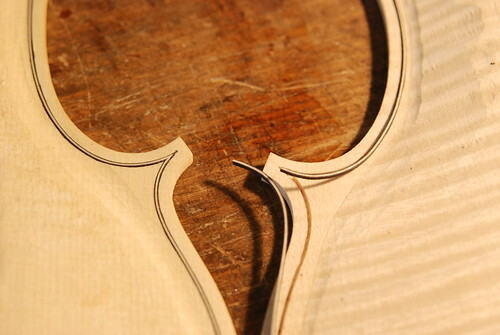 Well, what looks like a “line” is actually the result of a thin canal that was cut out around the contour of each instrument’s front and back, into which a thin, flexible strip of wood was inlayed. This strip is itself composed of three thin slices of wood that look like a sandwich – two strips of blackened wood with a strip of white wood in the middle. This strip – “filetto” in Italian, which means “thread” – varies in width according to the size of the instrument. Just to give you an idea how thin it is, well, in a violin it’s about 1.2 mm wide (that’s a bit over 0.04 of an inch for all you Americans out there!). 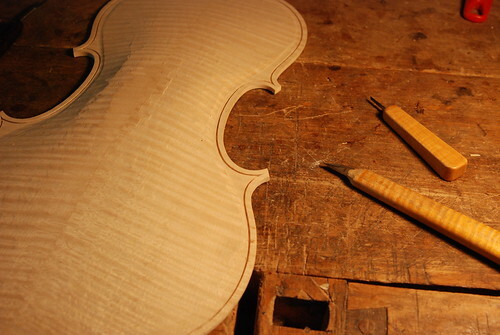 And thus the Purfling process – cutting out the canal and inlaying the wooden strip – is called “filettatura” (pronounced fee-le-ta-too-ra, with the accent on the “tu“). Sorry – but it always does sound better in Italian…. As a first step, the canal is cut out around the instrument’s contour. It must be cut out at an equal distance from the edge and remain exactly as wide as the wooden strip that will then be inlayed – throughout its entire length. The tricky part, as always, is at the corners themselves, where no instrument can be used to draw the line other than the human eye. Yonatan says “it’s like drawing a line with the knife” – only no erasing is possible, is it? That’s what Yonatan has done this week for two of the violins and the cello, and the viola, as always, was the last one to go. Working on the filettatura with a special set of extremely sharp knives is hard enough for a single instrument; doing one instrument after another – well, this is part of the challenge of creating an entire quartet at once! Can I use the few lines I have left to tell you something completely unrelated? So, yesterday was Saturday and we went with the kids to visit the new (and first ever) home we bought. It’s in a different town, about 20 minutes away from the one we currently live in, and since we finally got the key a couple of weeks ago, we try to drop by every weekend to help the kids (and ourselves…) become friendly with this new home. Anyway – the house currently stands bare and empty, awaiting renovations. It was pretty cold (in Israeli standards) so we decided to check if the old, cast-iron wood stove the previous owners left behind works. We found a pile of old pieces of wood outside that remained in a dry corner notwithstanding all the rain, and wondrously enough, had a happy warm fire burning in no time. We brought over a blanket from the car, and while little Alona (a year old this past month) fell asleep near the warm stove, Yonatan and the kids went to get take-away burgers, which we ate right there on the floor, in our new, totally empty house, in front of the burning fire.